The Boston Public Library is a municipal public library system in Boston, Massachusetts, United States, founded in 1848. The Boston Public Library is also the Library for the Commonwealth (formerly library of last recourse) of the Commonwealth of Massachusetts; all adult residents of the commonwealth are entitled to borrowing and research privileges, and the library receives state funding. The Boston Public Library contains approximately 24 million volumes, and electronic resources, making it the third-largest public library in the United States behind only the Library of Congress and the New York Public Library. In fiscal year 2014, the library held over 10,000 programs, all free to the public, and lent 3.7 million materials. According to its website, the Boston Public Library has a collection of over 23.7 million items, which makes it one of the largest municipal public library systems in the United States. The vast majority of the collection – over 22.7 million volumes — is held in the Central Branch research stacks. Between July 2012 and June 2013, the annual circulation of the BPL was 3.69 million. Because of the strength and importance of its research collection, the Boston Public Library is a member of the Association of Research Libraries (ARL), a not-for-profit organization comprising the research libraries of North America. The New York Public Library is the only other public library that is a member of the ARL. The library has established collections of distinction, based on the collection's depth and breadth, including subjects such as Boston history, the Civil War, Irish History, etc. In addition, the library is both a federal and state depository of government documents. Included in the BPL's research collection are more than 1.7 million rare books and manuscripts. It possesses wide-ranging and important holdings, including medieval manuscripts and incunabula, early editions of William Shakespeare (among which are a number of Shakespeare quartos and the First Folio), the George Ticknor collection of Spanish literature, a major collection of Daniel Defoe, records of colonial Boston, the personal 3,800 volume library of John Adams, the mathematical and astronomical library of Nathaniel Bowditch, important manuscript archives on abolitionism, including the papers of William Lloyd Garrison, and a major collection of materials on the Sacco and Vanzetti case. There are large collections of prints, photographs, postcards, and maps. The library, for example, holds one of the major collections of watercolors and drawings by Thomas Rowlandson. The library has a special strength in music, and holds the archives of the Handel and Haydn Society, scores from the estate of Serge Koussevitzky, and the papers of and grand piano belonging to the important American composer Walter Piston. 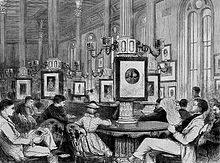 In the mid-19th century, several people were instrumental in the establishment of the Boston Public Library. 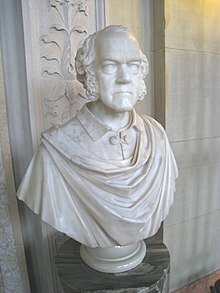 George Ticknor, a Harvard professor and trustee of the Boston Athenaeum, raised the possibility of establishing a public library in Boston beginning as early as 1826. At the time, Ticknor could not generate enough interest. In 1839, Alexandre Vattemare, a Frenchman, suggested that all of Boston's libraries combine themselves into one institution for the benefit of the public. The idea was presented to many Boston libraries, however, most were uninterested in the idea. At Vattemare's urging, Paris sent gifts of books in 1843 and 1847 to assist in establishing a unified public library. Vattemare made yet another gift of books in 1849. Josiah Quincy, Jr. anonymously donated $5,000 to begin the funding of a new library. Quincy made the donation while he was mayor of Boston. Indirectly, John Jacob Astor also influenced the establishment of a public library in Boston. At the time of his death, Astor bequeathed $400,000 to New York to establish a public library there. Because of the cultural and economic rivalry between Boston and New York, this bequest prompted more discussion of establishing a public library in Boston. In 1848, a statute of the Great and General Court of Massachusetts enabled the creation of the library. The library was officially established in Boston by a city ordinance in 1852. Mayor Benjamin Seaver recommended to the city council that a librarian be appointed. In May 1852 the city council adopted the recommendations of the mayor and Edward Capen was chosen to become Boston Public Library's first librarian. Eager to support the library, Edward Everett collected documents from both houses of Congress, bound them at his own expense, and offered this collection to help establish the new library. At the time of Everett's donation, George Ticknor became involved in the active planning for the new library. In 1852, financier Joshua Bates gave a gift of $50,000 to establish a library in Boston. After Bates' gift was received, Ticknor made lists of what books to purchase. He traveled extensively to purchase books for the library, visit other libraries, and set up book agencies. Public Library, Boylston Street, 1858–1895 (demolished 1899). 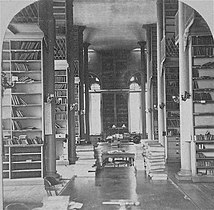 Reading Room in 1871 at the first Boylston Street building, the library's location between 1858 and 1895. By 1880, the Massachusetts legislature authorized construction of an even grander library building. A site selected was in Back Bay on Copley Square – the prominent corner of Boylston Street and Dartmouth Street, opposite Richardson's Trinity Church and near the first Boston Museum of Fine Arts. After several years of debate over the selection of the architects and architectural style for the new library, in 1887 the prestigious New York firm of McKim, Mead, and White was chosen to design the new library. 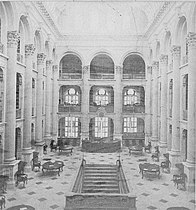 In 1888, Charles Follen McKim proposed a design based on the Bibliotheque Ste-Geneviève in Paris, in a Renaissance style which met approval from the trustees of the library, and construction commenced. The vast new reading room was called Bates Hall. In 1870, the library opened the East Boston branch, the first branch library in America. With the aim of increasing its reach throughout the city, the library opened 21 more branches in Boston neighborhoods between 1872 and 1900. In 1972, the Johnson building opened at the central Copley Square location, adjacent to the McKim building. The addition was designed by Philip Johnson. In 1986, the National Park Service named the McKim building a National Historic Landmark. As of 2006[update], the Library has had staffing and funding levels for conservation below that of its peers: the BPL's staff of two full-time conservators is significantly less than the New York Public Library's thirty-five. Many colonial records and John Adams manuscripts are brittle, decaying, and so in need of attention that the Library's acting Keeper of Rare Books and Manuscripts said that "they are falling apart." In 2011, the library completed a strategic plan, the BPL Compass, which featured eight community-identified Principles for Excellence. The principles in the plan and all of the related outcomes came as the result of a two-year community engagement process for which Boston Public Library received national recognition. In fiscal year 2012, the city of Boston spent 1.26% ($27,836,648) of its budget on the library, or $43.74 per person. 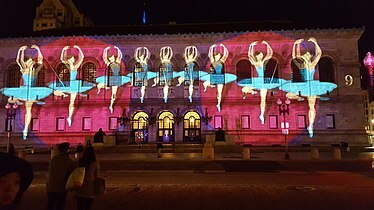 In 2013, the library unveiled its Collections of Distinction, an initial group of 18 collections that represent the most outstanding, expansive, and renowned of its holdings, Boston Public Library gives priority to Collections of Distinction with respect to public access, acquisition, digitization, preservation, and staff development. In fall 2013, the library began a renovation of the Central Library's Johnson building. In February 2015, the first phase of renovation opened on the Johnson building's second floor, including the new Children's Library, Teen Central, a community reading area, and the Adult Reference area. The renovated second floor cost a total of $18 million. The second phase of the Johnson building renovations opened in the summer 2016 and included the first floor, mezzanine, and exterior. In 2017, the library had 3,818,883 visitors to all locations, 4,933,786 items borrowed, and 9,839,461 visits to its website. The library also gained 82,911 new library card holders. 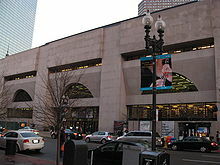 The Boston Central Library is located in Copley Square in Boston's Back Bay neighborhood. The central library consists of McKim Building and Johnson Building, and the two buildings are attached and interconnected with interior passageways. The central library as a whole with the two buildings combined contains 930,000 square feet (86,000 m2) of space and houses 21 million items in its collections as of 2015. The McKim building houses the BPL's research collection. Designed by Philip Johnson, a late modernist addition (which somewhat anticipated postmodernist architecture) was built in 1967–1971 and opened in 1972. The Johnson building reflects similar proportions, and is built of the same pink Milford granite as the McKim building. Critics have likened it to a mausoleum, citing the small percentage of windows relieving the massive walls in its exterior façade. Upon opening, the Johnson building became the home for the BPL's main circulating collection, which includes works in many languages. It also serves as headquarters for the Boston Public Library's 24 branch libraries. In 2013, the library began a major renovation project on the Johnson building. The first phase of the renovation opened in February 2015 on the Johnson building's second floor and features a new Children's Library, Teen Central, a community reading area, and Adult Reference area. The second phase includes renovations to the buildings first floor, mezzanine, and exterior and opened in the summer 2016. The $78 million renovation includes a new business innovation center and business library, a radio broadcasting studio for WGBH (FM), a 3D printer, and a café. The Boston Public Library hosts thousands of free public programs each year, including Author Talks, Local and Family History lectures, the Lowell Lecture Series, Concerts in the Courtyard, and art and history exhibitions. The Boston Public Library also offers many daily events for children, teens, adults, and seniors, including story times, therapy dog story times, book discussions, film showings, ESL conversation groups, and research and technology classes. The Boston Public Library offers desktop computers with pay-for-print services for public use and free wireless internet at the Central Library all 24 branches for anyone who has a wireless-enabled mobile device and a library card. Plug-in Ethernet access is also available in the McKim building's Bates Hall and the Honan-Allston Branch's Adult Reading Room for up to 2 hours. Library-card holders can also borrow laptops for in-library use for 2 hours at any location. The library offers a variety of digital services and collections. The online catalog, also available for mobile devices, allows users to browse and place holds on materials including books, audiobooks, DVDs, and CDs. Users can also download ebooks, e-audiobooks, music, and video through BPL's OverDrive site and check out Zinio magazines for the computer, tablet, or smartphone. Library card holders and e-card holders can also stream movies, television shows, music, and audiobooks through Hoopla Streaming Media. Many of the Boston Public Library's collections are available to the public online, including rare books and manuscripts, the anti-slavery manuscript collection, historical children's books, the John Adams Library, historic maps from the Norman B. Leventhal Map Center, historical images, prints, and photographs, sound archives, and silent films. Many of the library's digitized works can be found either through the Boston Public Library Flickr page or through their collections on the Digital Commonwealth. Britannica Learning Zone Encyclopædia Britannica, Inc.
Britannica Library Encyclopædia Britannica, Inc.
Britannica School Edition Encyclopædia Britannica, Inc.
Britannica Spanish Reference Center Encyclopædia Britannica, Inc.
Credo Reference Credo Reference Ltd.
Mergent Archives - Historical Annual Report Collection London Stock Exchange Group Mergent, Inc.
Mergent EventsData London Stock Exchange Group Mergent, Inc.
Mergent Intellect London Stock Exchange Group Mergent, Inc.
Mergent Online London Stock Exchange Group Mergent, Inc.
Morningstar Investment Research Center Morningstar, Inc. Newspaper Archive Heritage Microfilm, Inc.
OverDrive eBooks, Audio Books, and Music Rakuten, Inc. OverDrive, Inc.
Value Line Value Line, Inc.
Boston Public Library has two digital partners-in-residence at the Central Library in Copley Square. The first is Internet Archive, a nonprofit digital library that offers permanent access to historical collections in digital format for researchers, historians, and the general public. The Digital Public Library of America provides access to digital content from American libraries, archives, museums, and historical societies. In the latter half of the 19th century, the library worked vigorously to develop and expand its branch library system. Viewed as a means to extend its presence throughout the city, the branch system evolved from an idea in 1867 to a reality in 1870, when the first branch library in the United States was opened in East Boston. The library currently has 24 branches serving diverse populations in the city's neighborhoods. North End Branch, 25 Parmenter Street. A delivery station was first opened in 1882. In 1913 the branch was located at 3A North Bennett Street. In 1965 it moved to its current building, designed by Carl Koch and Associates. South End Branch, 685 Tremont Street. "Library service was established in the South End in 1877. The Branch was located in the Mercantile Library Association until 1879 when it was moved to the English High School. In 1904 the Branch relocated to 397 Shawmut Avenue and then again in 1923 to the John J. Williams Municipal Building at Shawmut Avenue and West Brookline Street. On June 7, 1971 the South End Branch Library moved to a new building at its present location, which was on the site of the original Mercantile building." West End Branch, 151 Cambridge Street. "Library service in the West End was initiated in 1894 with the conversion of the Old West Church on the corner of Cambridge and Lynde Streets to library use. The West End Branch opened in February 1896. The West End Redevelopment Project necessitated closing the Branch in 1960. As part of the project a new building designed by Maginnis, Walsh and Kennedy opened in January 1968." Brighton Branch, 40 Academy Hill Road, Brighton. "When the town was annexed to Boston in 1874, the Brighton Social Library became a branch of the Boston Public Library. The same year the collection was moved from the Town Hall to a ornate library building named for Brighton notable, James Holton. In 1969 a new Brighton Branch building was opened. The building was designed by Norman C. Fletcher of the Architects Collaborative of Cambridge." Faneuil Branch, 419 Faneuil Street, Brighton. "Built in 1931 to replace a temporary location on Brooks Street." Honan-Allston Branch, 300 North Harvard Street, Allston. "Allston's library service began in 1889 in a delivery station in Frank Howe's drugstore at 26 Franklin Street. ... 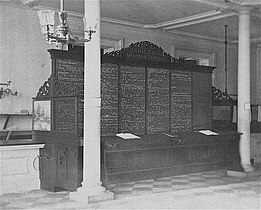 In 1905, the Allston Reading Room at 354 Cambridge Street replaced the 16-year-old delivery station. A BPL librarian staffed the reading room. It became a full-service branch of the Boston Public Library in 1924. The branch moved to rented space at 161 Harvard Avenue in 1929. ... In 1981, amid statewide budget cuts, the Allston branch was closed. 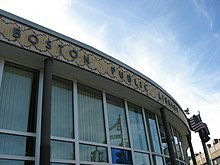 ... On January 19, 2000 ground was broken for the Allston Branch Library. Designed by Machado and Silvetti Associates ... the branch officially opened for business on Saturday, June 16, 2001. On March 13, 2003 the branch was renamed the Honan-Allston branch in honor of City Councilor Brian Honan." Charlestown Branch, 179 Main Street, Charlestown. "On January 7, 1862 the Charlestown Public Library was opened in the Warren Institution for Savings building. In planning for a year and a half the library opened with a catalog of 6,000 volumes. In 1869 the library moved to more spacious quarters in the new City Hall in City Square where it remained until 1913. The branch was then moved to the corner of Monument Square and Monument Avenue. ... In 1970 the Branch was moved to its current location." Adams Street Branch, 690 Adams Street, Dorchester. "Service to the Adams Street neighborhood was first provided in 1875 through a delivery station on Walnut Street. A reading room was opened at 362 Neponset Avenue in 1947. The present branch library building was opened in 1951." Codman Square Branch, 690 Washington Street, Dorchester. "Opened in 1905 the branch was named for John Codman a local preacher and patriot. Originally housed at 6 Norfolk Street, the branch moved to its present location in 1978. The building was designed by Eco-Texture, Inc."
Fields Corner Branch, 1520 Dorchester Avenue, Dorchester. "The Fields Corner Branch opened in 1969. It was the successor to the old Dorchester Branch which was also located in Fields Corner." Grove Hall Branch, 41 Geneva Avenue, Dorchester. "The first library in this section of Roxbury opened May 1, 1898 in the rear of Mr. Mowry's Drug Store at the corner of Warren Street and Haynes Park with one table, eight chairs, two shelves and 200 books. ... In 1919 the building on the corner of Warren and Savin Streets officially became the Warren Street Branch Library. 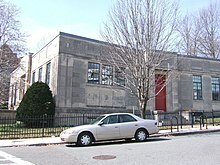 In 1926, this branch moved into its new quarters in the New Roxbury Memorial High School and thus became the Memorial Branch Library. The Memorial Branch was replaced in December 1970 by the Grove Hall Branch Library located at the corner of Warren and Crawford Streets. On April 4, 2009 the new branch library at 41 Geneva Avenue ... opened. Located in the newly-renovated Jeremiah E. Burke High School, the new library was designed by Schwartz/Silver Architects." Lower Mills Branch, 27 Richmond Street, Dorchester. "Library service in Lower Mills was first offered through a branch delivery post in 1875; it was open three hours each day to take requests for books and to deliver books requested from the Central Library and the Dorchester Branch Library. Full branch services began in 1876 with a dedicated collection and expanded hours. In 1883, branch service was moved into the vacated Blue Hills Bank building. In 1931, space owned by the American Legion was purchased and in 1936 a small addition was completed. Eventually the collection outgrew that building and the present Lower Mills Branch Library building was opened in 1981." The branch is scheduled to close in autumn 2010. Uphams Corner Branch, 500 Columbia Road, Dorchester. "In 1904 the Uphams Corner Branch Library moved from a temporary store-front location on Dudley Street to the two-year-old municipal building on Columbia Road." East Boston Branch, 365 Bremen Street Street, East Boston. 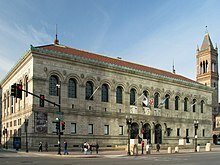 "Established in 1869, the East Boston Branch Library was the first municipally supported branch library in the United States. It opened in the old Lyman School with the collections of the East Boston Library Association and the Sumner Library." The current East Boston Branch, designed by William Rawn Associates, Architects, Inc., opened in November 2013. Hyde Park Branch, 35 Harvard Avenue, Hyde Park. "The town of Hyde Park opened its first library in the Cobb's block of Everett Square in 1873. In 1884 it moved to larger quarters in the Masonic Block at the corner of Harvard Avenue and River Street. Ground was broken for the Town Library in December 1898 and the ... building was opened in September, 1899. The Library became a branch of the Boston Public Library when the town joined the City of Boston in 1912. ... In 1997 ground was broken for a new addition and a renovation of the existing building," completed in 2000. It is now the third-largest branch in Boston Public Library, after the Central Library and the West Roxbury branch, with area of 23,000 square feet (2,100 m2). Connolly Branch, 433 Centre Street, Jamaica Plain. 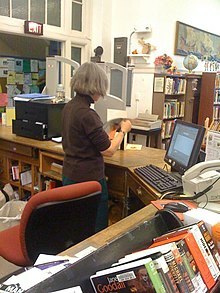 "Library service to the Hyde Square area of Jamaica Plain began in 1897 with a small book deposit in the rear of a neighborhood pharmacy at the corner of Lamartine and Paul Gore Streets. Eventually, in 1905 the Boylston Branch, named for the Boylston Railroad Station, opened its doors. Responding to the need for larger space, a beautiful white limestone building was built and opened in 1932. Designed by Maginnis and Walsh in the Jacobean style, the large arched entrance leads to a large interior space with wood and glass partitions dividing the adult and children's area. The ceilings, decorated with plaster moldings, are reputedly inspired by the Rufford Abbey Library in England. On December 12, 1940, the name of the branch was officially changed to the Monsignor Arthur T. Connolly Branch, as a tribute to Monsignor Connolly, a long-time member of the Boston Public Library Board of Trustees and pastor of the neighboring Blessed Sacrament Church." Jamaica Plain Branch, 12 Sedgwick Street, Jamaica Plain. 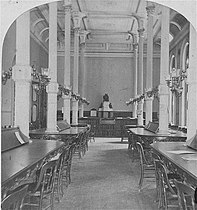 "The Jamaica Plain Branch began in June, 1876, as a small Reading Room in Curtis Hall, with books supplied by the Roxbury Branch of the BPL. 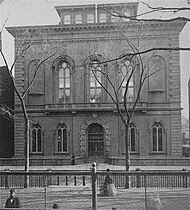 In September, 1877, it expanded and became the first BPL branch to purchase books from public funds. After a fire in 1908, the present building was constructed. The architecturally distinctive building features large schoolhouse windows and two fireplaces. It opened on July 24, 1911. An addition was built in 1936 and the interior was remodeled in 1963." In June 2015, it was closed for renovation. It reopened in May 2017. Mattapan Branch, 1350 Blue Hill Avenue, Mattapan. A "small reading room was granted Branch status in 1923. 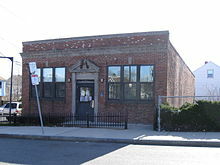 ... On June 22, 1931 the Mattapan Library Branch at 10 Hazelton Street opened its doors. ... On February 28, 2009 the ... new Mattapan Branch at 1350 Blue Hill Avenue" opened, designed by William Rawn Associates Architects, Inc.
Roslindale Branch, 4238 Washington St., Roslindale. "Library service has been provided to Roslindale since 1898. At that time, a book delivery station was located in a drugstore at the corner of Washington and Ashland Streets. ... In 1900 the library was moved to the Old Taft's Tavern building. In 1918, having outgrown its quarters, the library moved to the Municipal Building at the Corner of Washington Street and Cummins Highway. When the municipal facility became outmoded plans were made to move the library again. At the corner of Washington and Poplar Streets was a fire house which was torn down for the new library site. In 1961, a semi-circular building with huge glass windows, topped with a low blue dome, was designed by Isidor Richmond and Carny Goldberg." Dudley Branch, 65 Warren Street, Roxbury. "The Dudley Branch Library opened its doors in its current location at 65 Warren Street, in April of 1978, replacing both the Mount Pleasant Branch and the privately endowed Fellowes Athenaeum." Egleston Square, 2044 Columbus Avenue, Roxbury. "Opened on July 8, 1953 the building was designed by the firm of Isidor Richmond and Carney Goldberg." Parker Hill Branch, 1497 Tremont Street, Roxbury. "The Branch first opened in a rented space at 1518 Tremont Street in July 1907." In 1929 Ralph Adams Cram designed the current building, opened in 1931. South Boston Branch, 646 East Broadway, South Boston. "The South Boston Branch first opened in April 1872 in the Masonic building at 372 West Broadway. It was the second branch library established in the United States. When the Masonic building was sold in 1948 the South Boston Branch was closed. ... The branch was reopened in June 1950 in a storefront at 385–8 West Broadway were it remained until destroyed by fire in May 1957. The present building ... consolidated the City Point Branch with the South Boston Branch." West Roxbury Branch, 1961 Centre Street, West Roxbury. 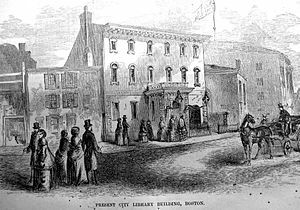 "In 1876 the Boston Public Library created a delivery station when it took over the collection of the West Roxbury Free Library. In 1896 it became a full branch of the Boston Public Library. In 1921–22, a new library building was built at the present site. In 1977 a devastating fire destroyed the neighboring West Roxbury Congregational Church and the land was deeded to the Trustees of the Boston Public Library for the purpose of an addition to the Branch building. On September 24, 1989 the new addition was opened to the public with community rooms, a gallery and a reading garden. The branch is home to the West Roxbury Historical Society." It is now the second-largest branch in Boston Public Library, after the Central Library, with area of 24,200 square feet (2,250 m2). 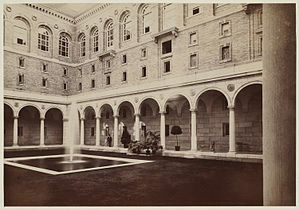 McKim Building courtyard, soon after opening, circa 1895. ^ "Summary Budget" (PDF). City of Boston. 2012. Retrieved 2013-11-16. ^ "BPL - Management Staff". Bpl.org. Retrieved 2013-01-02. ^ "BPL - Trustees". Bpl.org. Retrieved 2015-02-11. ^ Wayne A. Wiegand; Donald G. Davis (1994). Encyclopedia of Library History. Taylor & Francis. pp. 85–. ISBN 978-0-8240-5787-9. ^ "Massachusetts Board of Library Commissioners Legislative Agenda". Massachusetts Board of Library Commissioners. Archived from the original on 14 September 2013. Retrieved 3 January 2014. ^ "BPL By the Numbers: FY2014" (PDF). Archived from the original (PDF) on 2015-04-12. Retrieved 2014-10-15. ^ "BPL - BP by the Numbers". Bpl.org. Archived from the original on 2014-12-02. Retrieved 2014-10-15. ^ "The Boston Public Library Fact Sheet" (PDF). Archived from the original (PDF) on 2014-09-02. Retrieved 2014-06-24. ^ "The Boston Public Library". Archived from the original on 2014-12-02. Retrieved 2014-01-01. ^ McCrann, Grace-Ellen (2005): "Contemporary Forces That Supported the Founding of the Boston Public Library." Public Libraries, Vol. 44, no. 4, July/August 2005. ^ a b McCrann 2005. ^ a b c "BPL - History and Description". Archived from the original on 2014-06-26. Retrieved 2014-06-24. ^ MacQuarrie, Brian (2006-10-06). "Library lacks means to repair old tomes". The Boston Globe. Archived from the original on March 22, 2007. Retrieved 2006-10-06. ^ "Compass Strategic Plan". BPL. Retrieved 2 January 2014. ^ July 1, 2012 through June 30, 2013; cf. Commonwealth of Massachusetts Board of Library Commissioners (2014). "FY2012 Municipal Pie Report" (PDF). Archived from the original (PDF) on 2014-07-28. Retrieved 2014-06-24. ^ "Collections of Distinction". BPL. Retrieved 2 January 2014. ^ "BPL - Central Library Renovation Fact Sheet" (PDF). Retrieved 2014-06-24. ^ a b Cook, Greg. "Research: First Look Inside The Boston Library's Astonishing, Colorful Renovation". Retrieved 26 June 2015. ^ "BPL - BPL by the Numbers". 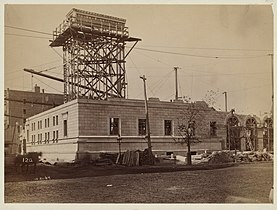 www.bpl.org. Retrieved 2018-04-01. ^ a b c d "Boston Public Library : Fact Sheet" (PDF). Boston Public Library. Boston Public Library. 17 June 2015. Archived from the original (PDF) on 10 October 2015. Retrieved 6 July 2015. ^ Goodwin, Jeremy D. (2016-07-08). "With $78M Renovation, Boston Public Library Aims For Friendlier Vibe". WBUR-FM. Retrieved 2016-07-11. ^ "May Author Talks and Lectures at Boston Public Library Locations" (Press release). Press Room: BPL.org. Boston Public Library. April 23, 2014. Retrieved 2014-07-10. ^ "Boston Public Library Celebrates 210 Years of Haitian Independence" (Press release). Press Room: BPL.org. Boston Public Library. May 20, 2014. Retrieved 2014-07-10. ^ "BPL - Calendar of Events". www.bpl.org. Retrieved 2017-12-08. ^ "Lifelong Learning Happens at Boston Public Library" (Press release). Press Room: BPL.org. Boston Public Library. 2013-08-30. Retrieved 2014-07-10. ^ a b c Perille, Gina (2013-12-27). "A New Year of Free Opportunities at Boston Public Library" (Press release). Press Room: BPL.org. Boston Public Library. Retrieved 2014-07-10. ^ "School Vacation Week Programs Await Families at Boston Public Library Locations" (Press release). News & Press Releases: CityofBoston.gov. City of Boston. 2014-02-11. Retrieved 2014-07-10. ^ "Boston Public Library - Computers and Technology". Bpl.org. Retrieved 2014-07-07. 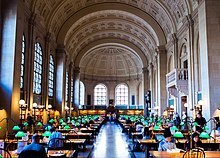 ^ "Dimension Data Brings Historic Boston Public Library Into The Wireless World" (PDF) (Press release). Newsroom.cisco.com: Cisco.com. Cisco. 2003-08-22. Retrieved 2014-07-10. ^ "Boston Public Library Expands Digital Offerings through Free Streaming Media Service" (Press release). Press Room: BPL.org. Boston Public Library. 2014-03-25. Retrieved 2014-07-10. ^ "Boston Public Library - Online Collections". Bpl.org. Retrieved 2014-07-08. ^ "Boston Public Library". Flickr. ^ "Boston Public Library". Digital Commonwealth. ^ Boston Public Library. "Electronic Resources: A-Z List". Archived from the original on August 20, 2017. ^ "DatabaseUSA.com". Omaha, Nebraska. Retrieved August 20, 2017. ^ a b Data Boston. "MiscSup Gen Library Books: Library Department: BPL Technical Services Office". Open Expenditures. City of Boston. Retrieved August 20, 2017. ^ "Comp-index.com". Indiana: Computer Indexed Systems. Retrieved August 20, 2017. ^ "Boston Public Library Accomplishments - FY14" (PDF). Bpl.org. Retrieved 2014-10-16. ^ "BPL - Neighborhood Branch Libraries". Bpl.org. Retrieved 2014-06-30. ^ a b c d e f g h i First Report of the Free Public Library Commission of Massachusetts. 1891; p.29. ^ "Retrieved 2010-06-08". Bpl.org. 1967-06-01. Retrieved 2013-01-02. ^ "Retrieved 2010-06-08". Bpl.org. 1971-06-07. Archived from the original on 2013-01-05. Retrieved 2013-01-02. ^ "West End Branch". BPL. Retrieved 2013-01-02. ^ "Brighton Branch". BPL. Retrieved 2013-01-02. ^ "Faneuil Branch". BPL. Retrieved 2013-01-02. ^ "Honan-Allston Branch". BPL. Archived from the original on 2013-07-09. Retrieved 2013-01-02. ^ "Charlestown Branch". BPL. Archived from the original on 2013-01-05. Retrieved 2013-01-02. ^ "Adams Street Branch". BPL. Retrieved 2013-01-02. ^ "Codman Branch". BPL. Archived from the original on 2013-01-05. Retrieved 2013-01-02. ^ "Fields Corner Branch". BPL. Retrieved 2013-01-02. ^ "Grove Hall Branch". BPL. 2009-04-04. Retrieved 2013-01-02. ^ "Lower Mills Branch". BPL. Retrieved 2013-01-02. ^ "Uphams Corner Branch". BPL. Retrieved 2013-01-02. ^ "East Boston Branch". BPL. Archived from the original on 2013-01-05. Retrieved 2013-01-02. ^ "East Boston Branch". Boston Public Library. Archived from the original on 15 March 2014. Retrieved 2 January 2014. ^ "Hyde Park Branch". BPL. Archived from the original on 2013-10-15. Retrieved 2013-10-15. ^ "Connolly Branch". BPL. 1940-12-12. Retrieved 2013-01-02. ^ "Jamaica Plain Branch". BPL. 1911-07-24. Retrieved 2013-01-02. ^ "Mattapan Branch". BPL. Archived from the original on 2013-01-05. Retrieved 2013-01-02. ^ "Roslindale Branch". BPL. Retrieved 2013-01-02. ^ "Dudley Branch". BPL. Retrieved 2013-01-02. ^ "Egleston Square Branch". BPL. 1953-07-08. Retrieved 2013-01-02. ^ "Parker Hill Branch". BPL. Retrieved 2013-01-02. ^ "South Boston Branch". BPL. Retrieved 2013-01-02. ^ "West Roxbury Branch". BPL. 1989-09-24. Retrieved 2013-01-02. Boston City Council. Proceedings at the dedication of the building for the Public library of the city of Boston: January 1, 1858. Whitehill, Walter Muir. "Boston Public Library: A Centennial History. Harvard University Press, 1956. Willis, Catherine J. "Boston Public Library" (Images of America series). Arcadia Pub, 2011. New library branch opens in East Boston. Boston.com. November 4, 2013. Boston Public Library’s Copley branch getting a makeover. Boston Globe. December 3, 2013. Wikimedia Commons has media related to Boston Public Library.